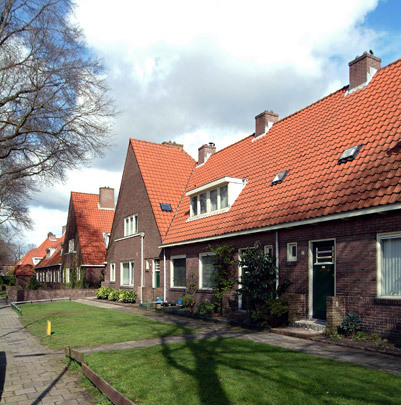 As Director of Public Works Dudok designed many workers' districts. The dwellings here have simple plans and are grouped in blocks of two to six units. A variation in height and staggered building lines supply diversity. Its urban unity comes from the use of traditional courts, portal buildings, and shrubberies in combination with one monumental building (public bath, library, school). The rural feeling is further strengthened by the lack of main roads.